Working as a public defender Nii handled many cases, one that illustrates my belief that attorneys can bring hope to a dark situation was the case of a young lady who was arrested for possession of marijuana. Upon meeting her it was learned that she was a new mother, and she wanted to plead guilty to the charged offense. Her desire to plea guilty was not due to actual guilt, but so that she would not have to miss any more time from work and could still provide for her baby. After reviewing the police reports and the dash camera footage, we determined that her detention was illegal. Additionally, she had no knowledge that the friend she was giving a ride to that night was in possession of marijuana. Due to the fact that the detention was illegal (making the search illegal), and because she was innocent of the charged offense, the decision was made to fight the charge by filing a motion to suppress. After filing our briefs and having a hearing on the matter, the judge agreed with our position and suppressed all the evidence, resulting in a dismissal for our client. The look on her face and the excitement in her eyes when we won the case is something Nii strives to experience as much as possible. She was ecstatic and thoroughly happy that she took a leap of faith. Too often innocent people are convicted, and attorneys like Nii Amaa are necessary to protect their rights and assist them in making sure justice is served. The legal process, and your relationship with your attorney, should not be so cumbersome that you would rather accept a conviction for something you did not do, than to fight for your justice! The most common piece of feedback I hear from clients is that they sensed a true connection between us. They can tell that I care and am committed to their case. Though actually going through a trial may seem stressful, it has many benefits. There is truly no other process like it, and it is deeply rooted in the rights granted to every American. In fact, it is sometimes necessary to ensure that justice is served. 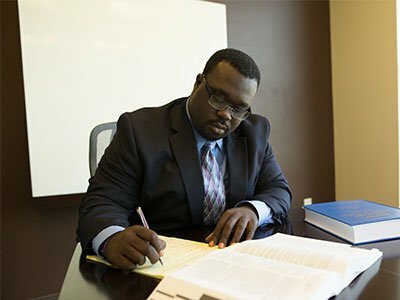 It is always Nii’s goal to reach an acceptable resolution of a case in pre-trial, but he is not afraid to litigate in the courtroom if necessary. Nii is dedicated to his clients 100% no matter the circumstance, and they recognize that. People often share that when they call Nii Amaa Ollennu Law Firm, PLLC, it is not because of voluminous reviews, but because we have some of the most sincere ones. They can tell from reading our client testimonials that we truly care about bettering the lives of others – and it is true. Every client is treated like family. Nii’s dedication does not stop there. He has a great passion for spending time with his friends and loved ones. In fact, in his free time he loves to cook and be outdoors bringing friends and family together for barbecues as often as possible. While attending the University of Idaho College of Law, a good percentage of the students there came to these barbecues. This is a testament to who he is as a person and as an attorney.